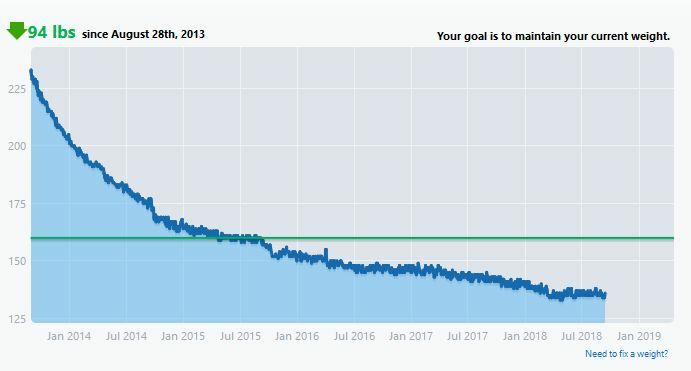 The green line on the graph is from the last time I set an actual goal weight in Lose It: 160 pounds. Once I hit that weight, I stopped actively trying to lose weight, and just kind of let things go until I bottomed out at a stable weight, which, for me, is apparently 135. I’m sticking with a goal of about 2100 calories per day, and I’m usually right around there (+/- 200). I’ve also done well on the exercise front, at least in terms of step count. I almost always hit at least 7500 steps a day and often go over 10,000. I never really did adopt any other exercise habits though. I never joined a gym or anything like that. Tracking all of my calories. Anything less than that makes it too easy to trick yourself into thinking you’re doing well, when it fact you’re still eating way too much. Packing my own lunch every day and not going out for lunch anymore. (I still go out occasionally, but maybe just once or twice a month.) It’s not hard to do, if you can figure out a few things you like to eat that stay within your calorie budget and aren’t hard to prepare and toss in a bag every day. In addition to the Lose It book I mentioned in the original post, this book on Volumetrics was pretty useful too.